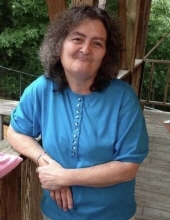 Kay (Cox) Sparks was born September 23, 1964 in Richmond and departed this life Sunday, January 13, 2019 at the St. Joseph Hospital in Berea, being 54 years of age. She was the daughter of the late Jesse Cox & Ruth (Tillery) Cox. Kay is survived by her daughter, Sarah Carr and her husband Brandon of Sand Gap and by two brothers, Jesse (Pug) Cox and Virgil Sparks both of McKee. She was blessed with three granddaughters, Addison Carr, Ava Carr, Amelia Carr; by a niece, Jesslyn Cox and by a special nephew, Brandon Sparks that she loved as her own. "Email Address" would like to share the life celebration of Kay (Cox) Sparks. Click on the "link" to go to share a favorite memory or leave a condolence message for the family.